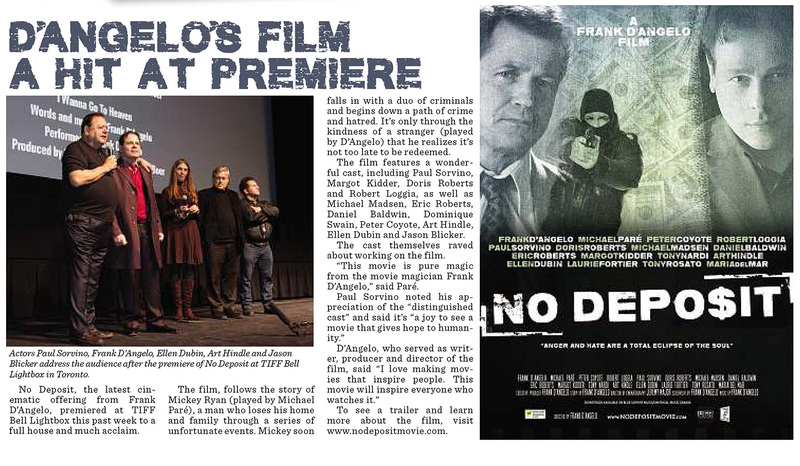 TORONTO, April 1, 2015 – It’s official: Frank D’Angelo’s new film NO DEPOSIT will have its world premiere April 24th, 2015 in New York City’s Greenwich Village at the Quad Cinema, 34 West 13th St., (www.quadcinema.com) during an exclusive one week engagement. Stars of the movie including actors Paul Sorvino, Doris Roberts, Michael Paré, and Frank D’Angelo will be on hand at the opening for media interviews and to meet and greet with fans. Frank D’Angelo’s second feature film wins Best Picture! this past weekend, Frank D’Angelo’s second feature film foray “The Big Fat Stone” took home the Best Picture award at the 2014 Movieville Film Festival in Bradenton, Florida. The movie was also nominated for Best Actress (Margot Kidder) and Best Director (Frank D’Angelo). The start of 2014 has been good cause to celebrate for Frank D’Angelo. TORONTO, September 23 – Frank D’Angelo’s Real Gangsters does it again winning best picture in Sarasota this past weekend at the Movieville International Film Festival.